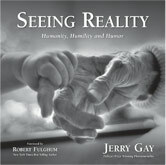 Seeing Reality is available on Amazon.com or at your favorite bookstore. Photojournalist Jerry Gay has driven over 500,000 miles of America's back roads and highways during the past 40 years to continue his personal passion to see reality in everyday life. His exceptional photography conveys his truly positive and persuasive analysis. Jerry visualizes reality and encourages us to see solutions for challenges we now face in our ambiguous universe.